Klorman Construction was the general contractor of the Foothill Transit Park and Ride Facility parking structure that provides parking for local residents who choose public transportation for their commutes into downtown Los Angeles. 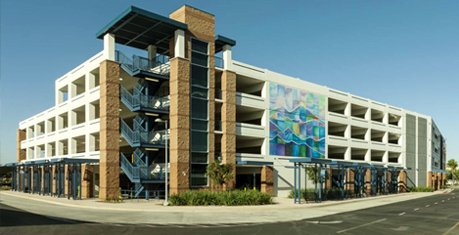 This 5-level, 216,000-sq ft, 620-car parking structure is Foothill Transit’s first ever agency-owned Park and Ride facility. The design embraces the materials and themes of the neighborhood while promoting Foothill Transit’s goals of a dynamic visual experience for those entering the city by rail or car. The facility has pedestrian plazas, electric vehicle charging stations, secure bike lockers for local cyclists, and solar-powered LED lighting and large art mural.